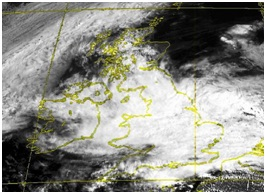 These erratic weather conditions, as reported by the Metro, have urged the Environment Agency to warn communities in the North and East of England, the Midlands and much of Wales to be prepared for further flooding, as bands of heavy rain are set to continue. Further reports show how East Anglia has already experienced a month’s rainfall in six – twelve hours and Norfolk, more than 36 hours of almost continuous showers. Additional rainfall can make it harder to keep windows clean. As well as making external glazing difficult to reach – with bad weather creating a further build up of dirt. The Pilkington Activ™ range, an intelligent collection of glazing solutions, provides a resolution to this problem, as the glass is continuously self-cleaning, and actually requires rain. The range, perfect for numerous areas in your home, comprises of three unique and highly functional products, all of which are self-cleaning and two off which offer the additional benefits of solar control properties. Pilkington Activ™ Clear is the world's first self-cleaning glass that has an advanced dual-action cleaning system, which helps deliver superior results. Pilkington Activ™ Blue, an attractive blue glass, combines dual-action, self-cleaning properties with solar control performance to deliver a glazing solution that helps to create cooler internal environments – ideal for conservatory, glass roofs and entire glass extensions. Pilkington Activ SunShade™ Neutral is an attractive, slightly grey coloured glass that again combines dual-action, self-cleaning properties with solar control performance, to helping to create cooler internal environment. This glazing solution is perfect for the vertical sides of a conservatory and large glazed areas. After years of development, the Pilkington Activ™ range is the world's first self-cleaning glass to use a microscopic coating with a unique dual-action. The first stage of the cleaning process is "photocatalytic", where the coating reacts with daylight to break down organic dirt. The second stage is "hydrophilic". 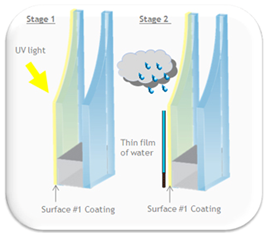 Here, instead of forming droplets, rainwater hits the glass and spreads evenly, running off in a "sheet", taking any loose dirt with it – whilst also drying quickly without leaving streaks. If the thought of spending endless hours cleaning windows puts you off building a new conservatory or installing skylights then self-cleaning glass is precisely what you need. To understand how the cleaning process works, and how you can benefit from its advantage please watch these two demonstration videos. Alternatively, visit our official website to read about the Pilkington Activ™ range.